Last year at Synergy Citrix Cloud Gateway was presented. Cloud gateway is the new Web portal from Citrix that provides more possibilities next to just publishing apps and desktops. Should have written this blog last year (had half of it ready then but never published it) so here you go, I think there are still people out there looking for information. I will write about these features later on in another blog but first let’s start at the beginning. Citrix last year at Synergy also announced a Citrix Cloud Gwateway Express edition… this edtion was build while they were walking on stage (not exactly but pretty close). The differences between the versions are listed in the table below. So to start let’s do a simple basic installation of the Cloud Gateway Express, the logical successor of Citrix Web Interface. After the installation I will continue about the configuration and how you can control where and how the applications and desktops are presented. I started of with a simple installation of the Microsoft Windows 2008 R2 server, simple as that. Downloaded the Citrix XenApp 6.5 ISO and the CitrixStoreFront-x64 msi to start with. Let’s assume you have Citrix XenApp running and you just want to add Storefront or wait Citix Cloud Gateway Express as it’s named. Underneath, with the Express edition you are installing StoreFront reciever of course.. If you look at MyCitrix.com you’ll see the two versions, Enterprise and Express. If you look at the downloaded file, it’s suddenly called CitrixStroeFront-x64. Let’s say that it needs a little remake in naming, but Oke, let’s hit it. The setup starts with a initialization, next of course a license agreement. 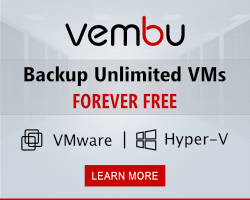 The installation is very very simple, next option you have is Install. As with many product StoreFront needs to be configured before you can use it, so after the installation the management console will start automatically. The first startup shows you the screen below, at least it does when you forgot to install a SQL 2008 server locally on your CloudGateway Express server. I didn’t read the manual before I started and therefore forgot about this. So after a few minutes of installing SQL Express I again start the management console and la Voila I can also deploy a single server. First question you get is to enter the base URL for the services, I entered http://XAWI01. It’s a demo so who cares about namings. Next job is to create a store, just enter a easy to remember name or something logicall. 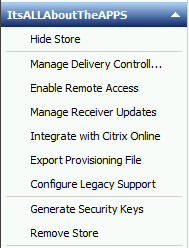 As Citrix CloudGateway is meant to deliver applications you have the possibility to select delivery controllers. There are three option with the Express edition, Citrix XenApp, Citrix XenDesktop and Citrix Cloud Gateway Enterprise. Only with CloudGateway Enterprise you will have Integrate ShareFile with receiver. I just added a XenApp controller, for the purpose of this blog article this controller type will do. If you want to add more type later on you can click on Stores in the console and select “Manage Delivery Controllers” on the right side menu bar as shown in the picture below. Next step is to configure remote access, this will only work when you have a Netscaler / Access Gateway server available. I chose none. The URL to access the store is displayed as soon as it’s created with the database connection string. As said before, let’s assume Citrix XenApp is installed. further more let’s assume you have published notepad. After the installation you might have the idea to fire up Internet Explorer and expect to see the applications. So let’s see what will happen when you do just that. You don’t see any applications, just a big + and a text saying “Add Apps”. So there you see a main difference between the old Web Interface and the new Storefront/Cloud Gateway product. With the old Citrix Web Interface all apps assigned to you where displayed straight away after you logged on. With the Cloud gateway you don’t see anything after you logon. But how do I get my applications? Your applications are to be found in the left hand corner when you click on the + like you see down below. The applications from your controller are visible here. If we take a look at the Citrix XenApp AppCenter console for a moment and we open the properties of any application you have published there. Under the menu option “Name” you’ll find the option “Application description”. Normally this is empty… but when you want to regulate the application your users see with Cloud Gateway you need to fill this field with some parameter(s). Auto: this option alwys displays the appication on the screen. Featured: this option will place the application in a Featured folder. TreatsAsApp, this option place the desktop in the apps folder. The featured parameter is used when yo u want the application to be found easily, so it would be a newly added application or a very often used application. The Auto parameter will be used for all the common applications like Microsoft Office, applications that users will always need. When a user has selected an application from the store, a green mark is placed behind it to indicate that it was added to the home screen. Citrix Cloud gateway treats a XenDesktop or a XenApp desktop as one, by default a seperate tab will be made available for desktops. So to access a desktop you need to click on the Desktop tab and to access applications you need to click on the Apps tab. If you want to change that, and depending on the amount of icons on your home screen you might, you need to add the parameter “TreatAssApp” in the description field of the desktop. The Desktop is added on the home screen and the TABs are gone. Also the icon is changed, that kinda not so nice imho. In the home screen next to Featured a menu Desktop is added. I would suggest to Citrix to add the option Desktops alwyas to the screen even if the desktops are on a seperate tab. It would make it easier for users to have a single access point. I hope you have gotten an overview of the Citrix Cloud Gateway and it possibilities. I haven’t covered external access here but just wanted to show how you can setup the product and get the applications to your users. So Ditch the web interface and use Cloud Gateway. The look and feel for users using different devices is the same on all devices. It’s easy to setup and simple to use when you use the parameters supplied.